5×7 LED matrix displays shown here have pointy plastic edges and are probably not very comfortable to sleep on. It is fun to contrast the remarkably different sizes of these two displays. The one on the left is from a large readerboard, and is four inches tall with 10 mm green LEDs. 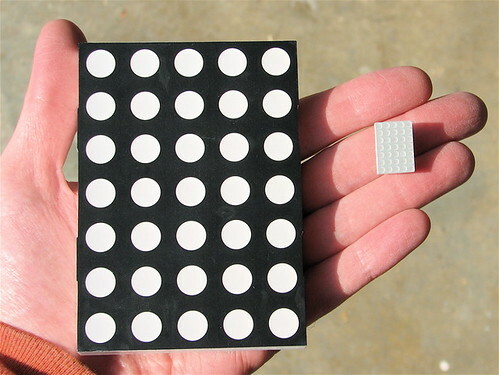 The dots are almost as big as the entire miniature version, shown on the right with its 3 mm red LEDs. More common than either of these sizes are the two-inch 5×7 displays that populate the readerboards sold at office supply stores. This entry was posted in Electronics, EMSL Projects and tagged electronics, LEDs. Bookmark the Permalink.